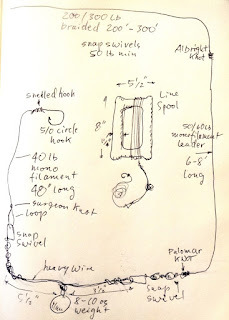 Here's some info on the handline rig I've been using to fish from my kayak. I got the design from my friend Marc who introduced me to his fishing grounds. This kind of rig makes it possible to fish from a sit-inside kayak. You don't need a sit on top with rod holders, bait wells, fish hatches, etc. etc. Much of the complexity of commercially sold kayak fishing setups comes from the fact that the industry wants to sell gear. It's that simple, and guys being guys want to buy gear. But you don't need all that much gear. So here it is, the handline rig. 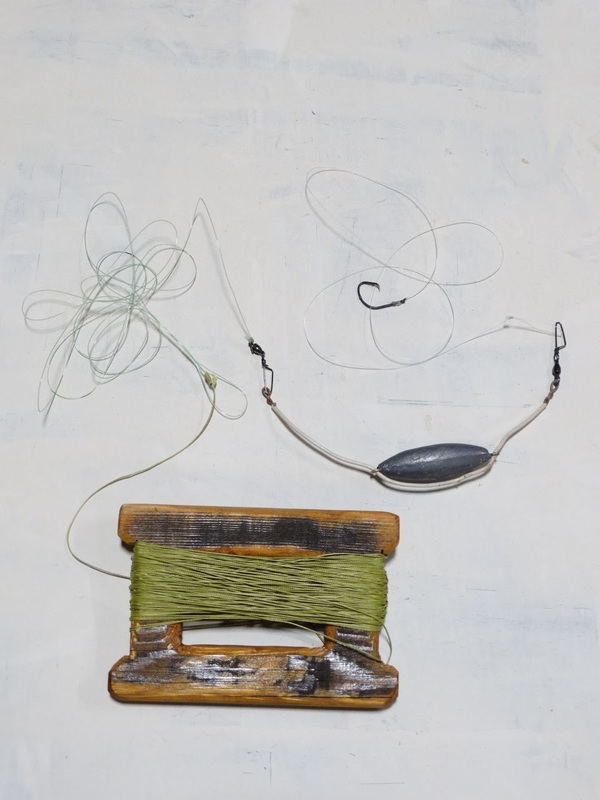 This photo shows the rig which consists of a wooden spool, 200 feet of 300lb braided spectra line, 8 feet of 60 pound mono leader, a 12 oz sinker assembly with swivel hooks followed by 4 feet of 40 pound mono leader snelled to a 5/0 circle hook. This is what the rig looks like set up for transportation. Fits nicely in a one gallon ziploc plastic bag. If the wire of the sinker assembly were a little shorter, it would store even better. This rig has 250 lb braided line with an 8 ounce sinker. 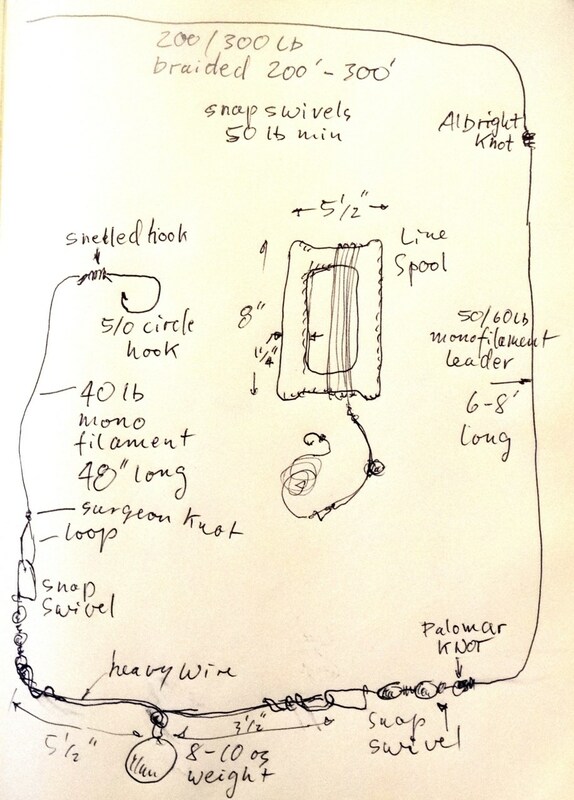 And here's a schematic of the handline assembly. Some additional comments on the schematic. The 300 pound braided line comes in various lengths, but 100 meters is a good spool size, that's about 300 feet of line. You can wind half of that on your spool or even all of it, depending on how deep you want to fish. The spool itself is made out of wood. A scrap piece of one by six will do fine. Before you commit to any dimensions, try wrapping your hands around a length of wood that is 3/4" thick by 1-1/4" wide and has the edges rounded. If the wood needs to be wider or narrower to feel comfortable in your hand, adjust the dimensions on the spool accordingly. If the long dimension of the spool is longer than 8 inches, you need fewer turns to spool up the line when you're retrieving a fish. On the other hand, a longer dimension will put more torque on your wrist. The length of the sinker assembly, which consists of a piece of coat hanger or heavy gauge copper electrical wire with a sinker attached to it should be about the same as the length of your wooden spool. This makes it easier to wind up for storage. Weight of the sinker should be roughly one ounce for every ten feet of depth you are fishing. That would be 10 oz for 100 feet of line, for instance. Rate of drift and weight of main line also makes a difference. You want your line to be as vertical as possible so you can know how close you are to the bottom. This is where a drift chute comes in handy if there is a wind blowing. The drift chute slows down your kayak and allows the line to hang more vertical. Some drift is ok, but you don't want your line going out at 45 degrees. Snap swivels should have a breaking strength at least that of the lines they are tied to, in our case, at least 50 lbs. I bought some that were 150 lbs which is overkill. Overkill is ok sometimes, but the 150 lb wire snaps are pretty hard to get open with bare hands, especially cold bare hands. And carrying pliers in a kayak is a nuisance. The idea with this rig is that when you are fishing rock reefs where there is a possibility of snags, you want the leader to break and lose maybe your hook and bait but not your sinker. 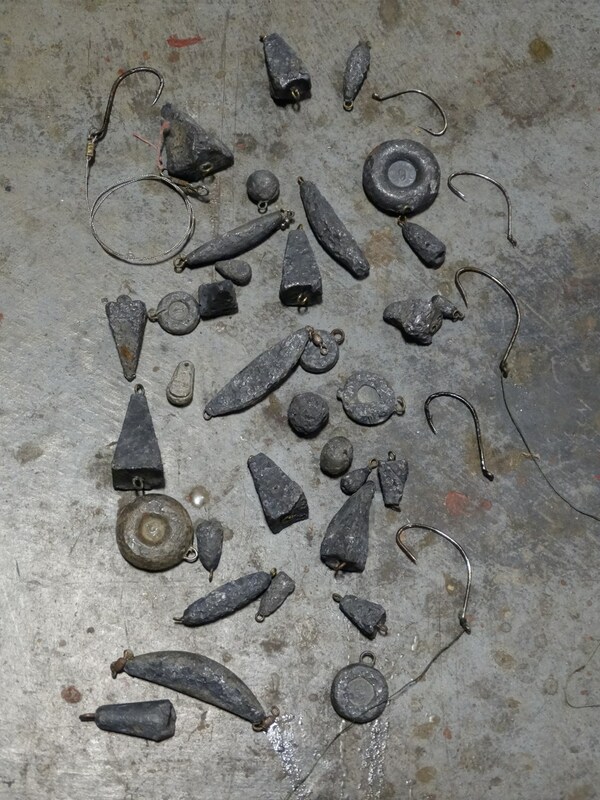 You can carry more snelled hooks and bait, but the sinkers assemblies are more bulky and you want to avoid losing them. Worst case, you snag the sinker and the 60 pound leader breaks, but you still have your main line. All the knots mentioned in the schematic can be found on the internet and youtube. 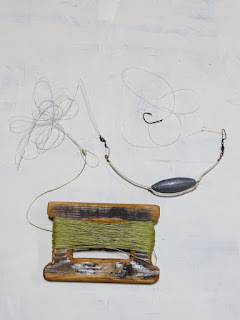 I tried using a double uni knot to tie the 60 pound mono leader to the 300 pound but the mono line was too stiff in comparison to the braided line so that the knot didn't work and ended up using an Albright knot which worked fine. 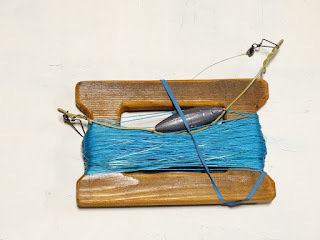 It takes a while to get the hang of some of these knots especially if you are watching a bad youtube or if you are working with stiff monofilament, but practice pays off. Thanks again to Marc who taught me this stuff. The lincod is resting on a plastic rice bag which I keep in my lap when fishing and into which I shove the fish that I catch. 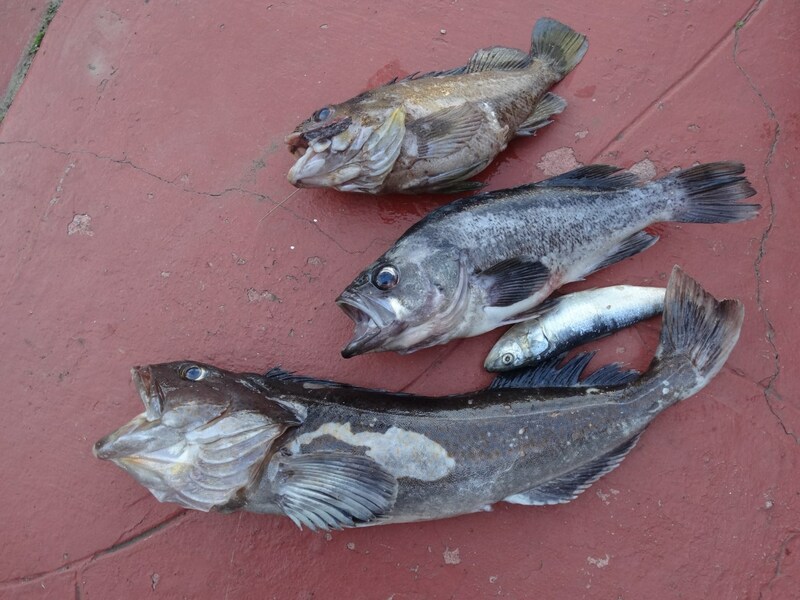 And here's some fish caught by handline, lincod, and two rockfish. The little guy is bait herring. 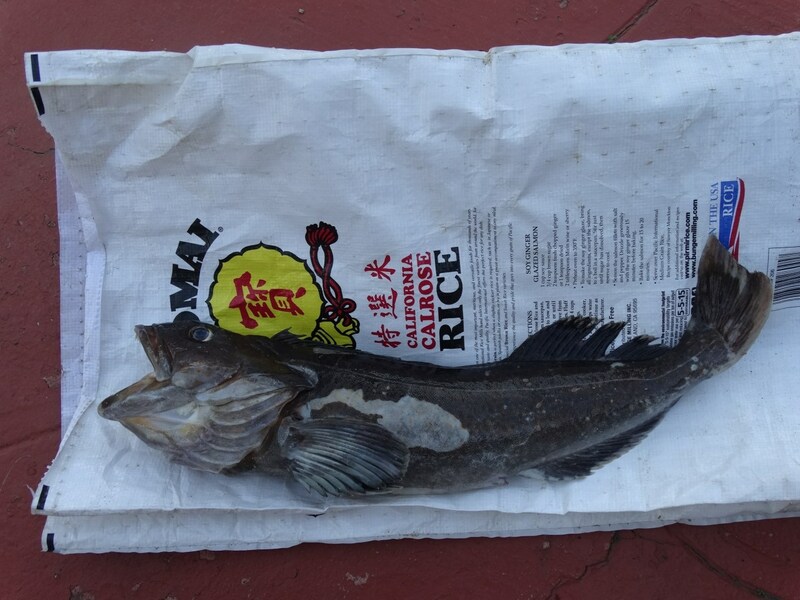 These guys were caught with octopus for bait. Sinkers off the street plus a few hooks. 5lbs 6oz total weight. Now that I've taken up kayak fishing, I need sinkers to attach to the ends of my lines. The other day, my wife and I were walking down the street in the direction of the local boat ramp and ran into a whole bunch of broken plastic laying in the street. Random litter we thought at first, but as it turned out, the litter was pieces of a plastic tackle box that had probably fallen off a boat that was being towed on a trailer away from the boat ramp. 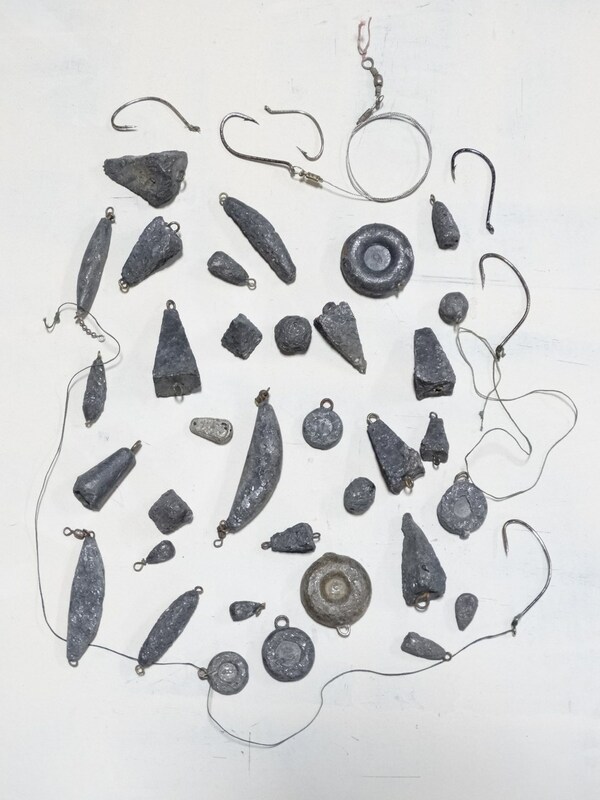 A little closer examination revealed a whole bunch of lead sinkers whose gray color camouflaged them very well against the background of gray asphalt. With my wife's help, I was able to fill two coat pockets with sinkers. I think I'm set for sinkers for a while and some unlucky fisherman needs to get him a bunch more. Sinkers arrayed on a white background.